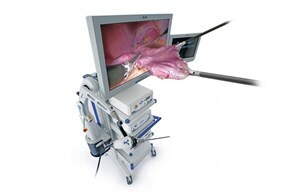 Robot-assisted laparoscopy has become established on account of outstanding 3D image quality. With its Einstein Vision 3D system, Aesculap offers an innovative solution for conventional laparoscopy. Superb Full HD visualization combined with the latest in 3D technology optimizes hand-eye coordination and can support the surgeon to maintain a high level of concentration. The spatial vision facilitates unerring work, helps to correctly pick up delicate structures, exactly positioning suture needles, and precisely separating extremely fine tissue structures. The Einstein Vision 3D system helps you to achieve excellent operation results.